Vimanas were ancient flying machines from Hindu mythology. Were they real? Were they not? I don't know. There is a real Pittsburgh project with the same name, however. I've never seen them live, nor are there any pfotos or links to Facebook on their Bandcamp. Who are these beings? Well on January 18th, 2018, they released a self-titled album. This is my excavation of such a thing. The cover of Vimanas. drew me to this album. It follows a trend in metal and noisy rock of ancient building and mythical imagery, but I still like the stark pyramid and the bold text. I don't like that the text bleeds into the bottom border with a slightly darker color. Anyway, what sludge metal or noise-rock was contained within these chambers? The musick on Vimanas actually isn't like that at all. The first track "Strange Attractor" starts with a cool dub sound that becomes more jazz. I find the lyrics sort of cheesy at first, but interesting later. "Do I think these songs are going to mean something? Something, someday, to somebody." The little keyboard flourishes are nice. "Beds" has a guitar sound like Dean Cercone or something I might have done a while ago, but it sounds acoustic. I like the theme of the song and the way that the vocals end before the song does. The guitar has a cool sound towards the end. "Doomed Inspiration" has an R&B feel and a song structure that has very juxtaposing parts. The guitar seems to be going direct; it sounds like Tom Verlaine's on "Little Johnny Jewel". I really don't like the vocals on "Moon", and the instruments aren't much to me either. The lyrics are okay, though they are quite flowery. The spacey sounds that fly over the track and the bass drum sound below are nice. "Whereunto" continues the mild musick with more vocals that just seem placed on top. I don't think the words fit so nicely into the holes they are given. "Starspawn" starts quickly after the sudden end of the last one. I don't like this one. The lyrics have a particularly New Age thing going on that I don't really care for and recalls those posts on social media of people talking about being made of "star stuff". "Reflector" has okay lyrics, but, again, I feel like they don't fit the jazzy musick very well. It's a shame because the musick sounds very nice towards the end of the track. "Can Word Affect Change?" is alright. I think the title is far too blunt. Again, I'm also not a fan of the vocals/lyrics. "Powerless To Try" is a jazz-rock instrumental. I like the drum sound and the guitar sound, once the song has built in intensity towards the end of the track. "Distant Moment Replay" has beautiful musick that reminds me of the anime A Piece of Phantasmagoria. The vocals really bother me again. The lyrical theme of self-reflection is good, but the words are not. "We thought our strings were out of tune. In fact, they sound better than that. We almost went our separate ways. Instead, we admitted faulty character traits and stayed." Sorry, I'm really not a fan of that. "Ancient Obligation" is pretty cool. I like the really out-there vocal effect at the end and the progressively building tones. "Endless" has some decent guitar lines, but I hate the drop after each line of the chorus and the tone of the vocals. I like the part where the flute sound leads the bass, but it's just placed over the top of everything else. This song is very disconnected. "Interregnum" is just a little instrumental piece exactly as it says. It's pretty good. I'm not going to discuss the vocals much more; just know that I don't care for them. I like the 70s movie score meets funk tone of "Modern Gem". I don't like "Progress". "Sparrows" is okay, comparing bird songs to text messages. I like the weird electronic drums and the background tones. The part of the song that's just all crash cymbals kind of lacks punch, though it kind of works as a droning section. "Immanuel" has really nice musick, more of that Phantasmagoria sound. The guitar has a beautiful reverb with pianos swirling around and synths floating in the sky. The vocals are poppier here, but I still dislike them. "Tomorrow Plans" has a good sound for a final song. So what are Vimanas? Well, Vimanas certainly have their own style. The complex structures, strange aerial loops, and verbose lyrics of these ancient crafts create something that I can't say I have ever listened to before. 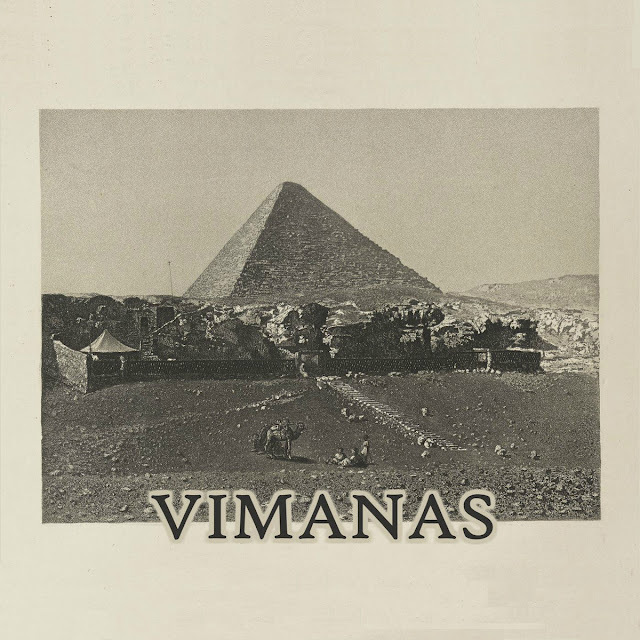 However, perhaps Vimanas should remain buried; the lyrics and vocals, especially the sing-song way in which they are sung and the obtuse word choice, really ruin the album for me. Had this album had a different lyricist and vocalist, I think I would enjoy the calm jazz of the musick. There is certainly a structure here for something to be built in the future; it really shouldn't stay buried, but it will need some future tech added. It pains me to say but, having discovered what I did upon this excavation, I can only give Vimanas a Bad. YO, this is really interesting that you found this. check out the whole trilogy if you got time.